"There is nothing we love more than the story of captive animals finally gaining their freedom, so this story from Wildlife SOS has got us smiling ear to ear!" I agree with their sentiment and was happy to see at last a picture of a downtrodden but free Mohan who had been held illegally in chains for 55 years. Finally, this starving and abused elephant gained what they so aptly called his 'sweet, sweet freedom!" I only hope that Mohan will become well enough to enjoy many more years of sweet freedom. Much thanks and appreciation is due to the hard work of Wildlife SOS who had worked tirelessly for over a year to free Mohan from his jailers. Abusers would be a better name to describe them. The effort was not easy. In 2015 the Wildlife SOS organization attempted a rescue of Mohan, but they were met by a mob of over 300 people who prevented the team from saving him. How incredibly sad that not only did Mohan have a brutal keeper, but there were so many people who backed him. 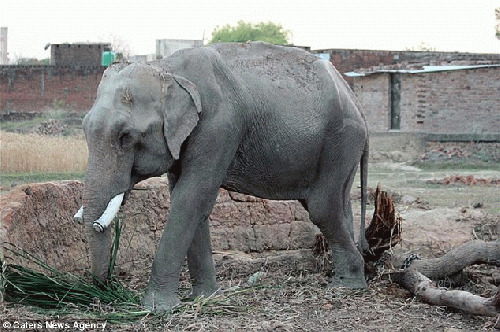 It became known that Mohan's keeper had been keeping him illegally, and so he realized he needed to file a revision to the local government to keep custody of Mohan. This led to an extended legal battle between Wildlife SOS, as well as a previous owner of Mohan and his current keeper. These cases had to be settled, which led to a very lengthy process. Of course, all this time Mohan's keeper let this poor elephant languish in abject misery. Thankfully, finally not only did Mohan find friends in Wildlife SOS but even the District Court in Pratapgarh India finally issued an order for the police to immediately file a motion against the people holding Mohan in illegal custody. But the battle wasn't over as anti-social elements in the area tried to sabotage Mohan's rescue efforts. But thankfully, with the presence of a large police force the unruly mob was kept in check, and with only damage to one vehicle. "The medical report dated 23 July 2016 confirms the elephant is thin and emaciated caused by severe starvation. It also mentions that wounds on his body and ears confirm beating and poking by sharp objects, as well as feet injuries that would lead to permanent joint disorders if not properly treated immediately. The elephant's dung had a lot of round worms and indicated severe worm infestation." I could not help thinking what a travesty is the notion that we are supposed to be the stewards of God's creation. But somehow I believe that these cruel people will be answerable to God, if not in this world then in the next. As for Mohan, he has finally been released from a hell 55 years long. Whatever time he has left on this earth, I pray that he will only know love, well-being, and happiness. Yes, Mohan, I'm saying a prayer to God that this may be so. I hope any readers who feel for you will also send a prayer to God for you as well.